And in the blink of an eye, I'm back in California again. Well, sort of. I was supposed to fly home on Saturday, but a big snow storm on Friday made it impossible to make the three-hour drive to St. Louis, so we decided to push my flight back a day. As much as I was ready to get out of 10 degree weather, I can't say that I minded all that much. The cold is one thing, but I do love how the snow makes this time of year feel much more special. It was nice to just spend the day inside with my nieces and nephew by the Christmas tree for just one more day before it was all palm trees and warmth. So it's really a win-win either way. Enough about the weather though, let's talk about these photos. I think that if I were a better photographer then maybe I wouldn't get so excited every time someone else takes phenomenal photos for me. But alas, I am not that a great of a photographer, and I do have to rave about these photos. Mary and I went to this housing track that I had never been to, and the light was absolutely perfect. This mint dress (that I'm wearing as a skirt) has been hanging on my wall as decoration all semester (it's just that pretty), so I keep forgetting that I can actually wear it. 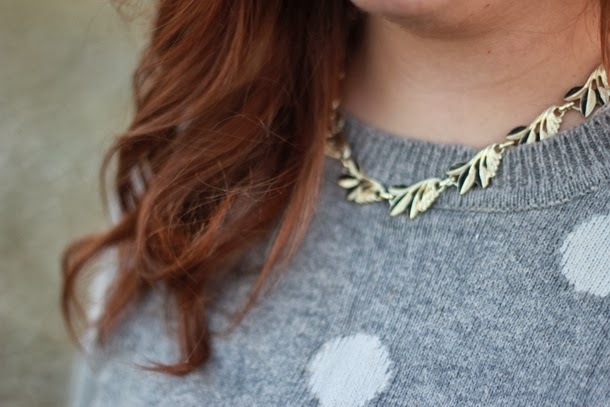 I decided to just make a theme out of items I've forgotten about, and pulled out this sweater I haven't worn in forever and this necklace that had been sitting in my room without a single wear until now. There was still a good amount of snow on the ground that day, so snow boots were a must as well. Katie also met us that afternoon to have Mary take outfit photos for her as well, and you have to check them out. 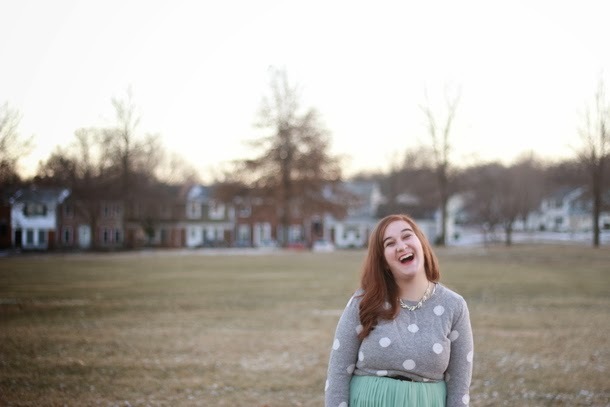 Mary's photography combined with Katie's model-esque looks and style was a match made in heaven. I'll be back to using my tripod all break, but hopefully I'll be able to post more over break. I'm way too pumped for a month of good food, no homework, and Christmas. One of these days I'll get my shopping done. Considering this is an outfit out of "forgotten" items, this might be my favorite outfit of December from you! 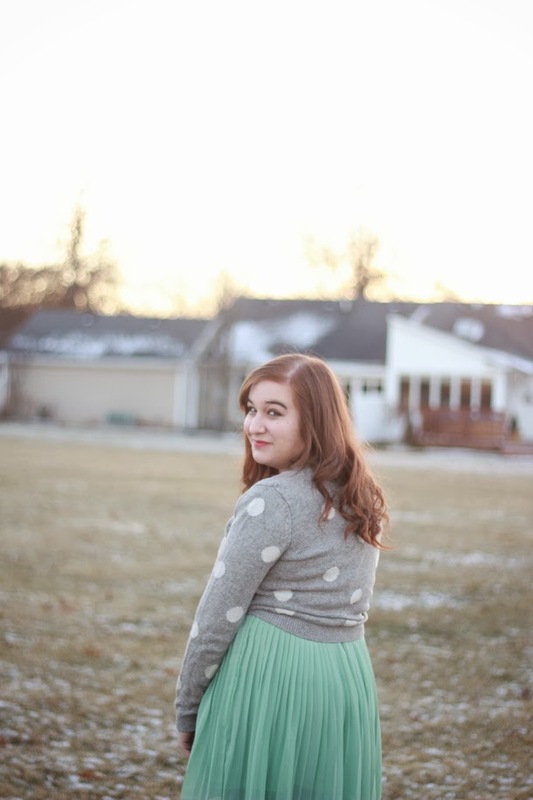 The mint goes so well with the grey and who can say no to polka dots! Oh you lovely lady, you! I love this outfit and the setting really is lovely. I hope you have an amazing break! I'm planning on taking off the days between Christmas and New Year's from both work and blogging and I can't wait to do some relaxing and catch up on all the things I've been neglecting! This is such a gorgeous outfit!! I absolutely love all these pieces together. That dress first off is such a fantastic colour and the polka dot sweater is sweet. Awww Elana you're so adorable :) I'm actually loving that outfit. Maybe I'll get a little preppier over break and we can be adorable outfit buddies. Miss you! I love these pictures. And I think you look really great in mint. 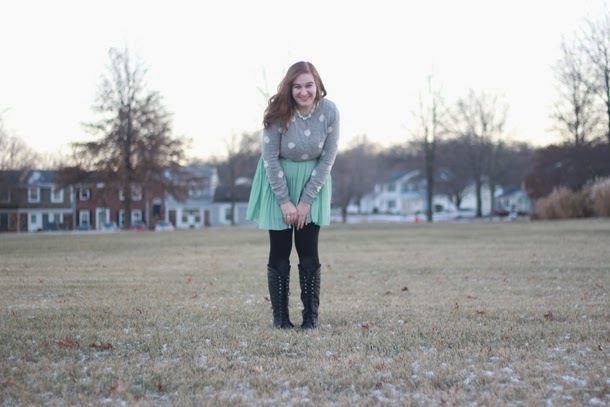 Love this adorable outfit and enjoy your winter break! Cute outfit! Mint and polka dots?! Hell yes! 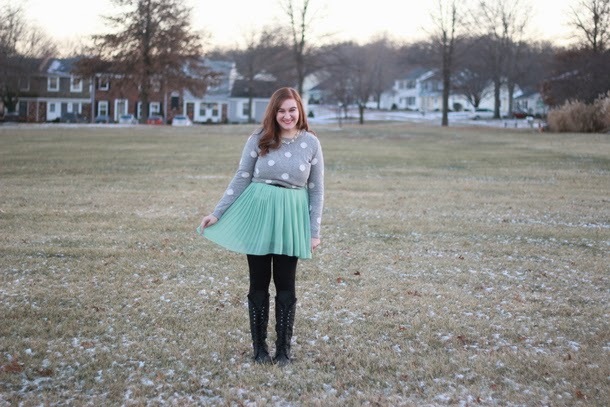 I love the mint paired with the neutral sweater... you look cute as can be! And I know, the snow is a pain to deal with when driving but it certainly adds to that Christmasy feel, huh? Congrats on surviving this semester! Haha you flew out and I flew back in- I am loving all this winter wonderland snow though ;) And this outfit is GORGEOUS- I love how the polka dots look with that delicate blue. So dreamy. And yaaay for surviving finals!! Girl, you are so adorable! I'm loving that skirt and the color is so pretty! I love the combination of polka dots and mint green. Cute outfit! Love this outfit, especially the colors. Can't wait to see this skirt styled again too, so pretty! 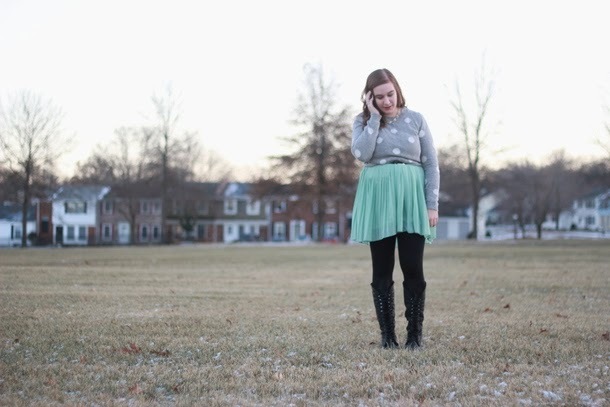 Hooray for winter break and hooray for an adorable outfit! I absolutely love the light in these pictures too. 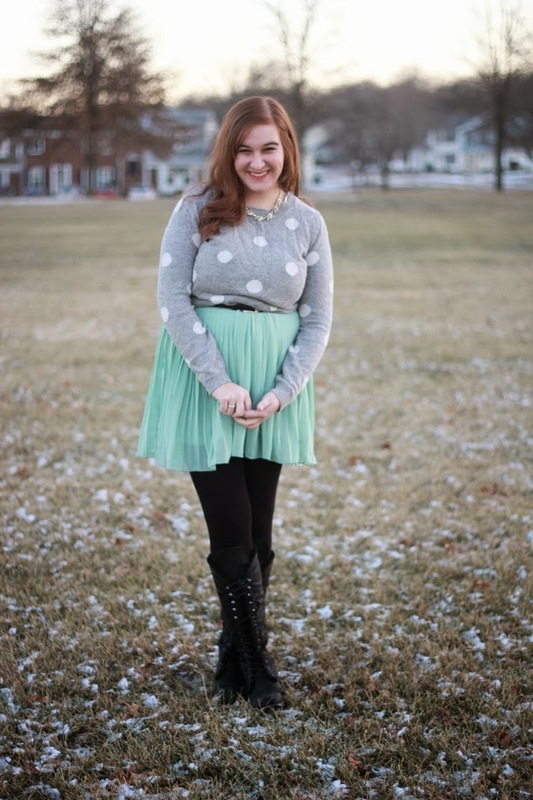 Your polka dot sweater looks perfect with that mint green skirt. Such a cute necklace too. I love this! The grey and mint are so bright and refreshing together. You look so pretty! 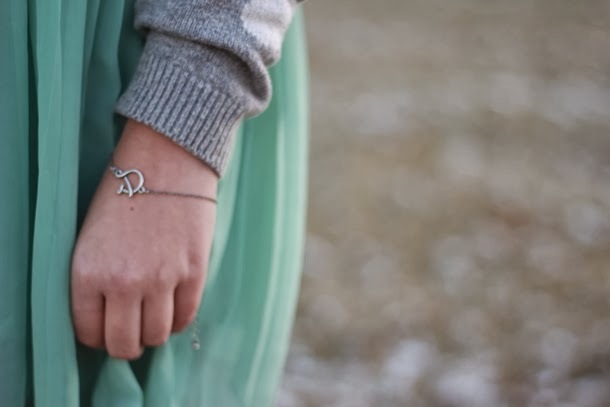 (Usually when I comment on your blog I have to check and make sure I haven't already commented the same exact thing already on this post) Oh Elana i LOVE this combo! It's absolutely perfect! These pictures are BE-Autiful as well. 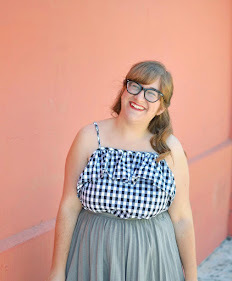 I had to go check out your friend Katie's blog as well! 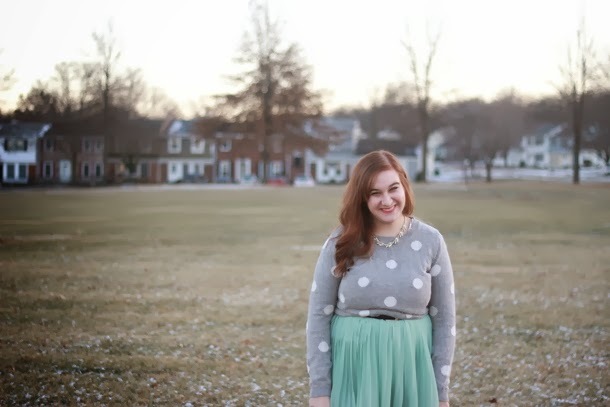 This polkadot sweater is just perfect! this is the greatest little combo, I LOVE it!